One of the most surprisingly interesting, and moving, moments on Dylan’s More Blood, More Tracks comes on the third disc, when, a few songs in, you suddenly hear the zzzzz of a tape recorder starting up. Apparently the engineer had just realized that something was going on worthy of being recorded. So we come in near the end of the first verse of “Spanish Is the Loving Tongue.” This is not one of Dylan’s originals: it’s an early-20th-century cowboy poem that was set to music in the 1920s. Almost everyone has recorded it, and Dylan seems to have loved the song deeply. He has played it many times in concert over the years — as YouTube amply demonstrates — and recorded two versions in studios. One of those, done when he had stopped smoking and found that weird crooning voice that you hear, most famously, on “Lay Lady Lay,” just might be the worst recording of his entire career. I can’t even bring myself to link to it. 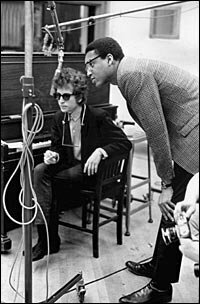 Here, when the recording engineer flips his switch, Dylan is playing guitar and is accompanied by the bassist Tony Brown and the pianist Paul Griffin. Griffin, by the way, is a remarkable figure. He played with Dylan on his great trio of mid-60s electric albums — you can see him with the whole band here, and there’s an unfortunately tiny photo of him and Dylan here — but he turns up all over American pop music, and often very distinctively. Yes, that’s him on “Just Like Tom Thumb’s Blues,” but that’s also him on Dionne Warwick’s “Walk On By”; that’s him playing electric piano on Steely Dan’s “Peg,” and, perhaps most famous of all, that’s him on “American Pie.” What a career. Anyway, here he is with Dylan again. Bob has, I suspect, just launched into “Spanish Is the Loving Tongue,” and Griffin and Brown are finding their slots in the song. I’m sure Dylan had no thought of putting it on his new record; he just loved the song and started playing it. And it’s magnificent. “Spanish Is the Loving Tongue” is a thoroughly inauthentic song. It’s not a real cowboy ballad; it’s belated, imitative. Like “Loch Lomond,” a 19th-century parlor song pretending to be an ancient Scots ballad, it’s completely fake and completely wonderful. 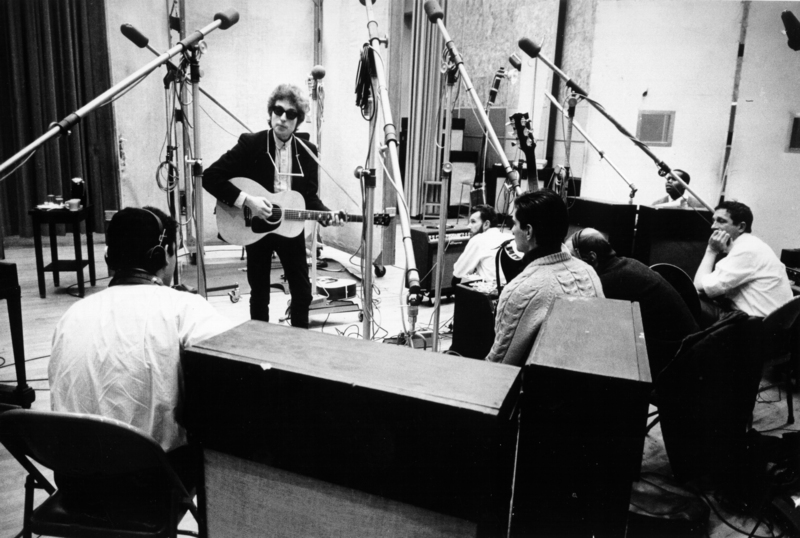 And here, fooling around in the studio, Dylan finds something deep inside the song — something emotionally real and raw and utterly compelling. Dylan and his wife Sara were going through their divorce at this time, and it is almost universal to hear Blood on the Tracks as a breakup record — perhaps the greatest breakup record ever made. In his liner notes for this collection, Jeff Slate notes that Dylan has disavowed such an interpretation, claiming that he got his lyrical ideas for the album from reading Chekhov stories. Slate treats that disavowal as definitive. Please. Blood on the Tracks is the greatest breakup record ever made, and the pain of that divorce is etched into every song. It’s also etched into many of the takes and rehearsals here: I defy you to listen to the first four cuts of disc 1 — two takes of “If You See Her, Say Hello” and two of “You’re a Big Girl Now” — and conclude that they arise from thoughtful reflection on Chekhov. And all that pain makes its way into this performance of “Spanish Is the Loving Tongue.” Brown quietly accents the melody with his bass, and Griffin finds a wonderfully appropriate groove, like a barrelhouse piano player who’s had too much to drink and is noodling through an old tune before heading off for bed. It’s relaxed and meditative; it sounds almost designedly unprofessional. It perfectly suits the deep melancholy of Dylan’s voice, which gives itself over unreservedly to this sentimental old song and makes of it something unforgettable.